Crash Test Mummy - 167 - Christchurch Roller Derby. Strong City. Stronger Skaters. My husband came up with my name and because I am a mum to four children. The number is my street address so I would remember it. Getting two awards on the same night after a great game. 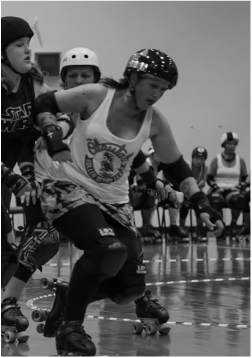 Trying to get through the pack as a Jammer. They are a great friendly team and took me on as a transferred skater.